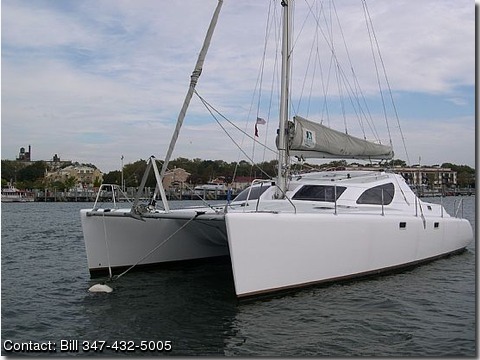 1999 Voyage/ Maxim 37 catamaran. Sloop rig Rollerfurling Genoa,doyle stack pack on main, twin 18 horsepower Yanmars with saildrives. First Maxim built it is the lightest strongest one made to date. Three cabins with queen size beds, large head with shower. Additional shower on stern for showering after swimming. Two single berths in addition to doubles. Large saloon with seating for eight. Galley up with two burner stove, fridge, sink. and ample storage, lots of counter space for food preparation. Nav station adjacent to saloon entrance chart table, and chart storage incorporated into nav station. Inverter with 110 volt lighting 110 volt outets in galley,saloon,and head. LED courtesy lighting, oversized 150 amp alternator added to standard alternators on engines Stainless steel water and fuel tanks 2X55 gallons of both water and fuel Gigantic lockers for sails and equipment on foredeck and in cockpit. Large cockpit seats six comfortably plus hemlsman. Excellent visability from helm entire boat is visable to operator no blind spots. Main and jib sheets lead to helm posistion. Assymetrical spinnaker with sock is a joy to use, Brand new rigid bottom inflatable dinghy, a five horsepower outboard with one summers use. This boat has served me well its perfect for entertaing or for a retired couple looking for a boat to take them across the bay or across an ocean. I have had as many as eighteen people on this boat to see the fireworks in New York Harbor. I have purchased a new Maxim and must sell my old one. Entire boat was painted two tone last year bottom paint is in perfect condition (six coats of micron last summer) Please call me for a demonstration sail you have got to see this boat to appreciate it.